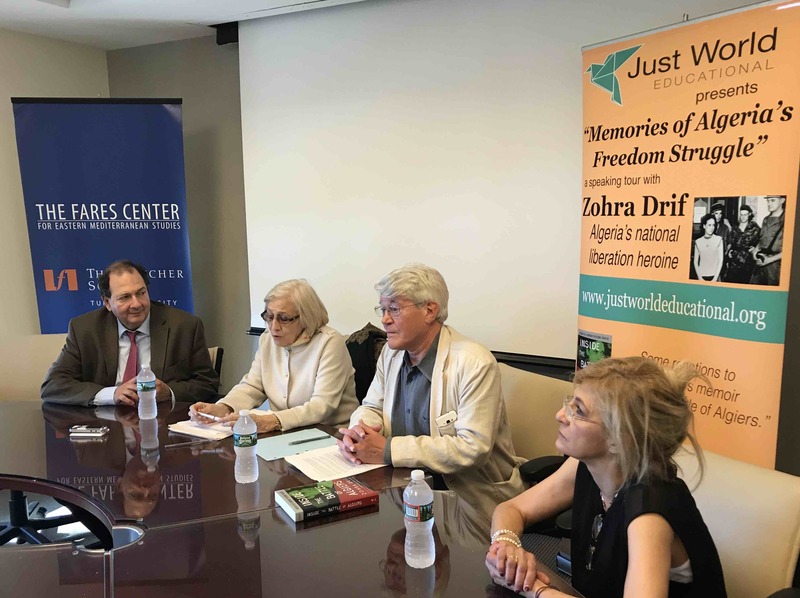 Algeria’s national-liberation heroine Zohra Drif wrapped up her 18-day U.S. speaking tour “Memories of Algeria’s Freedom Struggle” on October 4, returning to Algeria after enthralling audiences in nine public gatherings and a number of non-public encounters in Washington DC, New York, and Boston. Mme. Drif spoke at five great universities: Georgetown, New York University, Columbia, Harvard, and Tufts. She spoke at the Woodrow Wilson International Center for Scholars, a well-known “think-tank” in Washington DC. 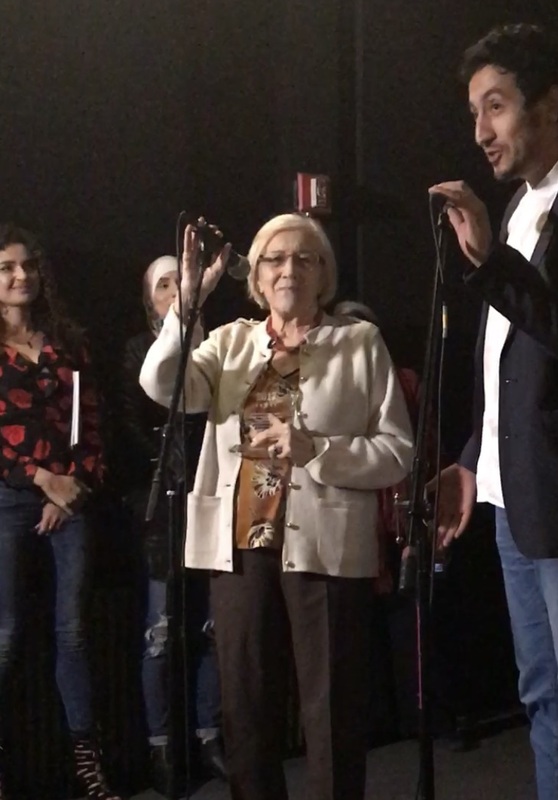 And while in New York, she also spoke to audiences in three community gatherings– all, as it happened, in Manhattan: at Alwan Center for the Arts; at the (Algerian-owned) Nomad Restaurant; and to an audience at Anthology Film Archive that had gathered to watch a newly subtitled remastering of a classic Palestinian film, “Kafr Kassem”. The photo above shows Mme. Drif with friends at Alwan. The photo at right shows her receiving an award at the showing the Palestinian film “Kfar Kassem”. In her remarks there, she noted the many parallels between the anti-colonial struggles of the Algerians and the Palestinians and lauded the efforts of the Palestinians to resist their occupiers. At each of the gatherings she spoke at, event hosts and audiences expressed their deep admiration for the significant and hard-fought struggle that Mme. Drif and her companeras/os in Algeria’s historic freedom movement, the FLN, waged for their country’s freedom in the period 1954-62. Nearly all of these events were “standing room only”, as Americans from all walks of life (and a good number of Algerians residing in the U.S.) gathered to meet, hear from, and pay their respects to this historic figure. At some of the university events, attendees had to cluster into anterooms and corridors to get a glimpse of Mme. Drif. Everywhere, the welcome she received was extraordinary! 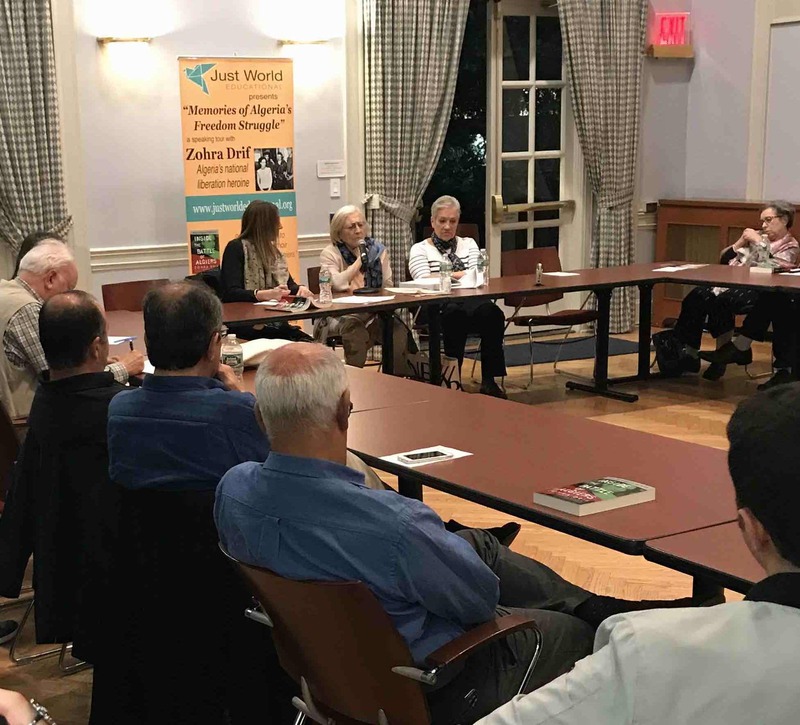 Zohra Drif at Columbia, Dr. Madeleine Dobie to her left. The depth of the misery in which France’s settler-colonialist rule over Algeria held the country’s people for the 130 years that it lasted. The fact that, despite the French authorities’ determined campaign to erase the Algerians people’s identity– they were defined under French law only as “French Muslims”, but without any of the civil or political rights accorded to French citizens– the vast majority of indigenous Algerians retained their understanding of themselves as the rightful owners of the land; as a people with their own long and proud history of self-government prior to the arrival of the French; and as a people who had resisted the French attempt to conquer their country for 35 years, in the mid-19th century. The key role that Algeria’s women (the “mothers and grandmothers”) had played in keeping Algerian identity and history alive for new generations, throughout the period of French rule. 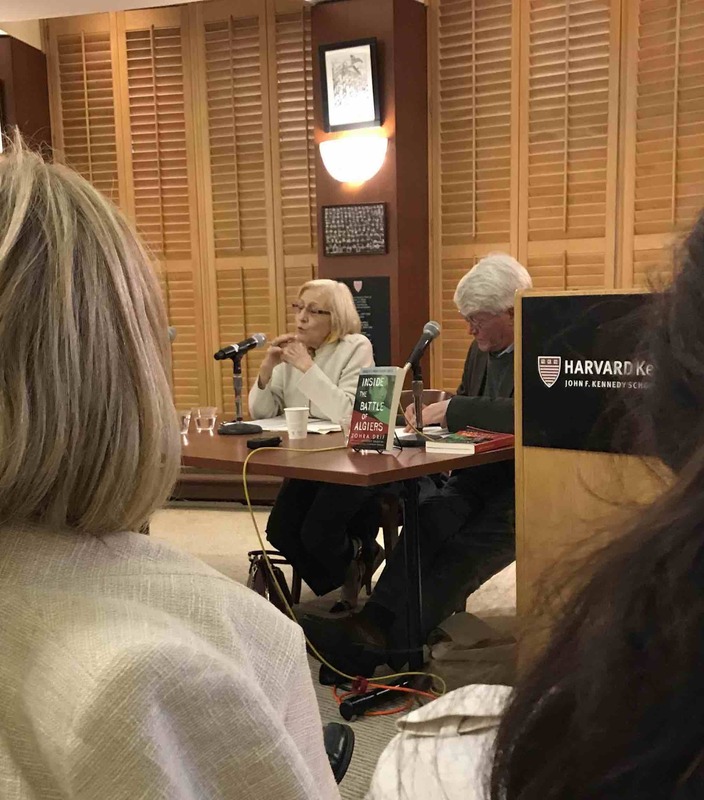 Zohra Drif at Harvard’s Kennedy School of Government, Dr. Hugh Roberts of Tufts (interpreting) at her right. The deep roots of the political and military campaign that the FLN (“Front du Liberation National”) launched in November 1954. The role that Algerian women played at all levels of the FLN’s struggle– including the role that she and a group of other female freedom fighters played in the movement’s armed wing. Her estimation that the armed struggle waged by the FLN was absolutely key to the movement’s having eventually forced the French to grant Algeria its independence. 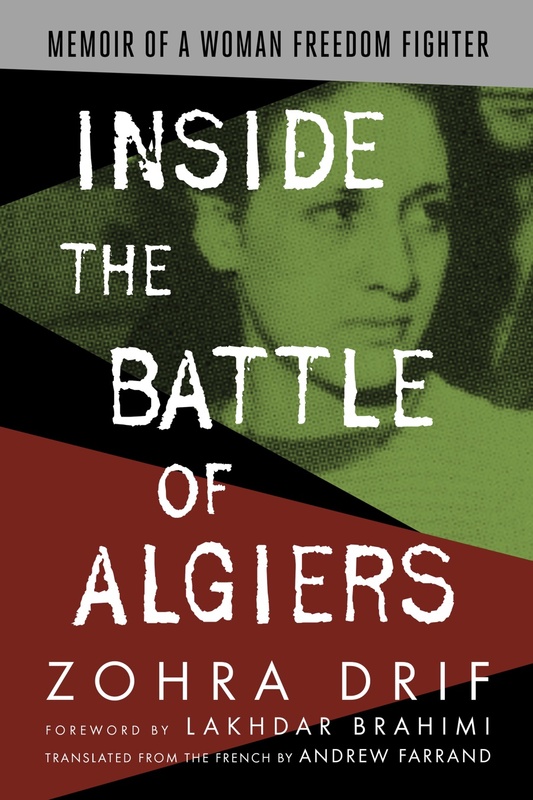 The determination that she and the other Algerian freedom fighters arrested by the French showed in continuing to pursue both their struggle and their self-education throughout their time in prisons in Algeria and in France. Zohra Drif at Tufts University. Dr. Nadim Shehadeh, head of the fares Center, at her left. To her right, Dr. Hugh Roberts (interlocutor and interpreter) and Mme. Djamila Bitat. Her strong opposition to all the external, non-Algerian powers that intervened in the country’s internal politics in the early 1990s, and that ended up trapping the country in a “Black Decade” of terrible civil strife. Her strong support for the rights and the freedom struggle of the Palestinians. Just a portion of the crowd at Tufts University’s Fares Center! Her commitment to the mission of telling the story of Algeria’s freedom struggle to new generations both in Algeria and around the world– at a time when many of the leaders and participants in that struggle are now passing away. Mme. 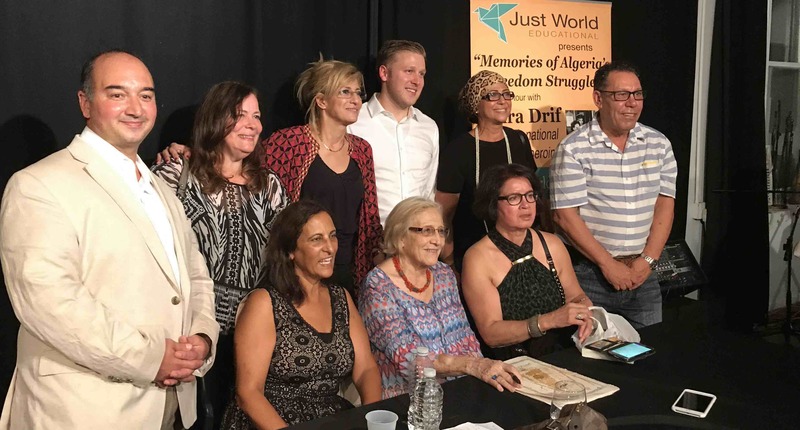 Drif was undertaking her tour to mark the release by Just World Books of the English-language version of her memoir, Inside the Battle of Algiers: Memoir of a Woman Freedom Fighter. Many of the above themes are explored in depth in the memoir, which has received enthusiastic plaudits from leading scholars of decolonization, women’s studies, and North African history. However, the book only goes up to the time of her arrest by the French authorities in September 1957. It does not cover either her time in prison or the lengthy career she pursued after she and all other Algerian political prisoners were freed as part of the final “Evian Accords” under which France withdrew its forces and its million settlers from the country in 1962. At that point, she was elected to the country’s first parliament. Later, she worked as a lawyer and with child-protection organizations before finally entering the country’s Senate more than a decade ago. In 2016, she retired from the Senate after serving several years as its Vice President. We at Just World Educational are extremely grateful to all the wonderful partners who worked with us to organize (and in many cases also re-organize) these opportunities for Mme. Drif to share her story, and to the many other individuals who helped to make her visit a possibility– and a very informative experience for all involved. This fairly detailed account of the first four events on the tour, published earlier here on the JWE blog. This Facebook Photo Album of the tour. This short report from the Wilson Center’s website, of the event she spoke at there. It has a lovely photo gallery in it. This great, detailed account by Sarah Grey (who edited Mme. Drif’s memoir), of the event at Georgetown University. This 9-minute video of a discussion that JWE President Helena Cobban had with Mme. Drif about Syria, on October 3. 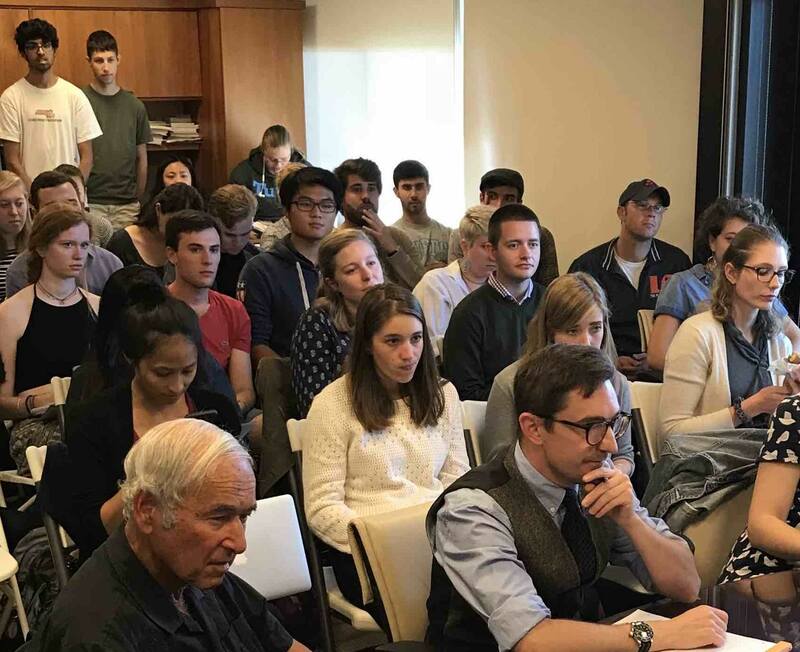 Two great accounts by Tufts University students of the discussion Mme. Drif had at the university’s Fares Center, October 4: This, by Monica Jiminez, and this by Hannah Uebele.